Happy New Year’s Eve from 365 Things To Do in the Twin Cities!! In a nutshell, here is what you need to know! Miller Lite will provide Free Rides on all Metro Transit bus, light rail and commuter rail routes, Wednesday, December 31, beginning at 6 p.m. until 3 a.m. Detailed route and schedule information is available at MillerLite.com/FreeRides.com, by calling 1-800-FREE-RIDES or by texting “FREE RIDES” to 90464. As you count down to the day we reset our counter we want to make sure everyone has fun and gets home safely. 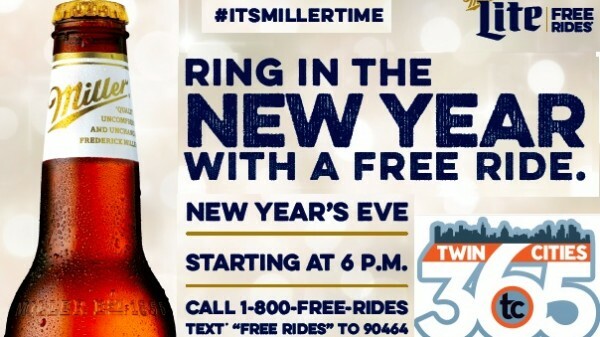 To ensure exactly that happens, our friends at Miller Lite has teamed up with Metro Transit to offer free rides again this New Year’s Eve! Miller Lite will provide Free Rides on all Metro Transit bus, light rail and commuter rail routes, Wednesday, December 31, beginning at 6 p.m. until 3 a.m. Detailed route and schedule information is available at MillerLite.com/FreeRides.com, by calling 1-800-FREE-RIDES or by texting “FREE RIDES” to 90464. 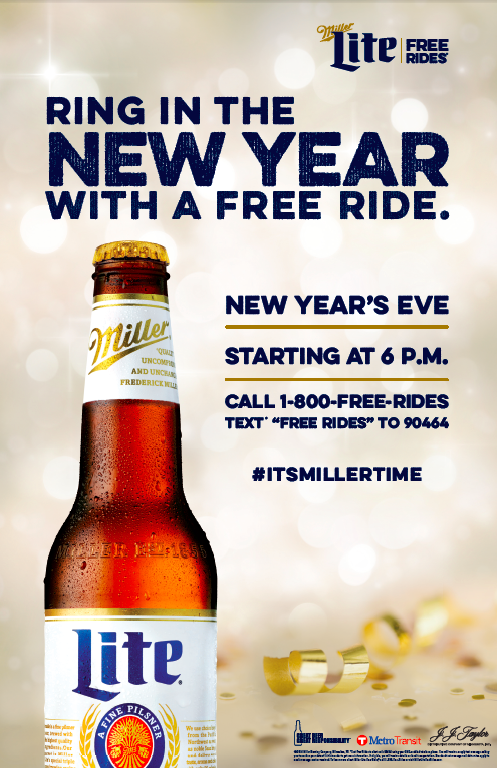 This is the fifth year that Miller Lite Free Rides have been available on New Year’s Eve in the Twin Cities. The program has provided a safe ride to more than one million people in the Twin Cities and has gained the full support of local and state law enforcement. So with that, be safe tonight Twin Cities! Party and have fun but get home safe. Happy New Year’s eve from all of us at 365 Twin Cities, Inc.